MITZPE RAMON, ISRAEL–The concentrated effort of all four Wooster Geologists in Israel finally paid off in fossil bryozoans today. 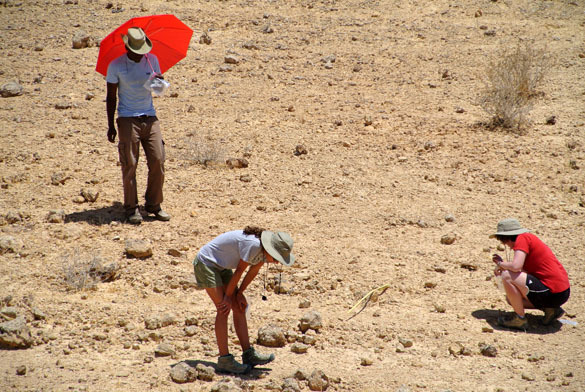 Steph Bosch (center) is studying the bryozoans of the Matmor Formation (Middle Jurassic) in Makhtesh Gadol for her Independent Study project. We have bryozoan specimens collected on earlier expeditions to the Matmor, but on this trip have been stymied in our efforts to add to the meager collection. Bryozoans are rare in these equatorial sediments, even though the diversity of other fossils here is very high. We want to describe this fauna for the first time and place it in its environmental and evolutionary context. This afternoon we visited a site at the far northeastern end of the makhtesh where we knew lots of crinoids were preserved. (The locality is creatively known as “GPS 004”; N 30.94916°, E 35.01110°.) Our working hypothesis is that bryozoans preferred the same conditions as echinoderms in the Matmor Sea. The strategy worked: we found two runner-type bryozoans on crinoid columns. They are the stomatoporid-type of uniserial runner, giving us at least two different species of bryozoan now from the Matmor. Undoubtedly there are more such specimens on the many crinoid ossicles we collected to wash and examine later in the Wooster lab. They are far too small to photograph here in my hotel room! Steph, appropriately, found the first specimen. Oscar Mmari (on the left) found the second just as we were leaving. Lizzie Reinthal (on the right) is actually working on crinoid taphonomy, so she was very pleased by all the specimens we collected today. 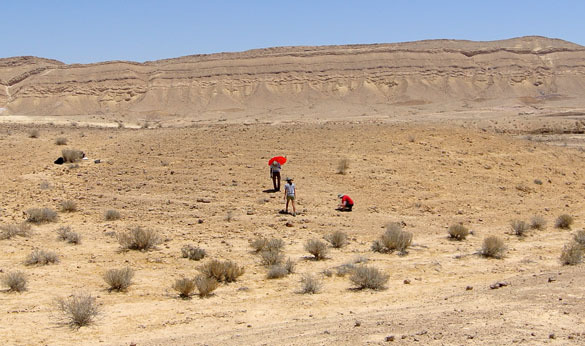 A wider view of our collecting site in the Matmor Formation, with the northeastern wall of Makhtesh Gadol in the background. It feels good to now have all three Wooster seniors with materials they’ve collected for their Independent Study projects. A nice way to end our first week of work in Israel! It is fascinating that universities communicate in this remarkable way. In France, no such thing do not seem to exist! Congratulations on finding some Jurassic bryozoans in Israel. Runners first, next up sheets.